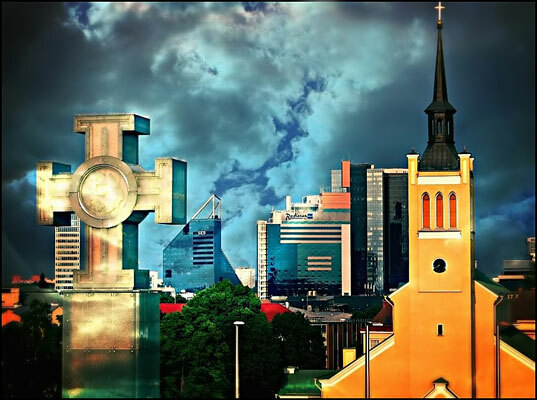 You may not know about it, but Estonia is actually one of the least religious countries in Europe. In Estonia most people are not serious about their beliefs and do not practice their religion. According to the surveys, only 14% of Estonia’s population consider themselves religious. The vast majority of people call themselves atheists or feel no concern for religion at all. However, the Estonians have always valued and respected all the traditions and tried to save any architectural monuments. There are only very few villages which do not have any churches at all, while cities have several of them. Since almost all of the churches were built by the Baltic Germans, Evangelical Lutheranism (Protestantism) has become the main religion in Estonia. The country has already been under the influence of the Russians, the Danes, and the Swedes and all three of them have left their impact on this country. The Czarist Russians have worked hard to popularize the Russian Orthodox Church in Estonia, but during Soviet times, public worship was prohibited. After the collapse of the Soviet Union, other former Soviet states immediately revived Christianity at the point of independence. In Estonia, however, it never really came about. Although the Lutheran Church is the largest in Estonia, it accounts for only 13% of the population. We can assume that this is linked with history. Young Estonians learn about the waves of invasion and imposure of Christianity during history lessons. Christianity is seen as the faith of the colonizers, which is why it is immediately rejected. That does not mean that Estonians do not believe in anything at all. Besides the «standard» religion, there are other ones, for example, nature worshippers. They consider nature their God and define their religions as Maausk, which is a form of Estonian nature spirituality. It is rather an unorganized religion because no ceremonies and religious texts are needed at all. Over 50% of Estonians say that they believe in spirit or life force. It does not matter what religion people are as Estonians are still very passionate about their country.